← OUR DEBT SLAVERY EXPLAINED–PLEASE WATCH! But how do the oligarchs control us with money? Simple–THEY are allowed to 1) create the money and 2) sell it to us. They have taught us to call this, respectively, 1) a “loan” and 2) “interest.” They have taught us this since birth, to the point where it really doesn’t even need to be taught anymore, it’s just accepted as the natural state of things. In fact, the oligarchy’s mind control about money is so complete that they feel perfectly comfortable admitting, in public documents, that money is created from nothing, and has no real value except that which we give to it in our own imaginations (see “9 Mind-Blowing Facts About Money” just as a starting point). So whether we want to admit it or not, we are in fact living under the heel of a system that keeps us in constant desperation and compliance because we have been made to believe that we must perform intense labor for the benefit of someone else in exchange for tokens that have value only because we imagine them to have such value. In other words, we create the money and give it value, but we are told that it is banks and governments that do that and that is the reason we are told that they must have power over us. In other words, the way to win the class war totally peacefully is to simply acknowledge, by law, that money is now created and always has been created and given value by the people, not by banks and governments. And because that is true now and always has been, each person ought to be legally given the power to issue their own currency, for any amount. The day that happens–class war over. Problem solved. Wouldn’t that make money worthless? Yes, of course–but it already is worthless. 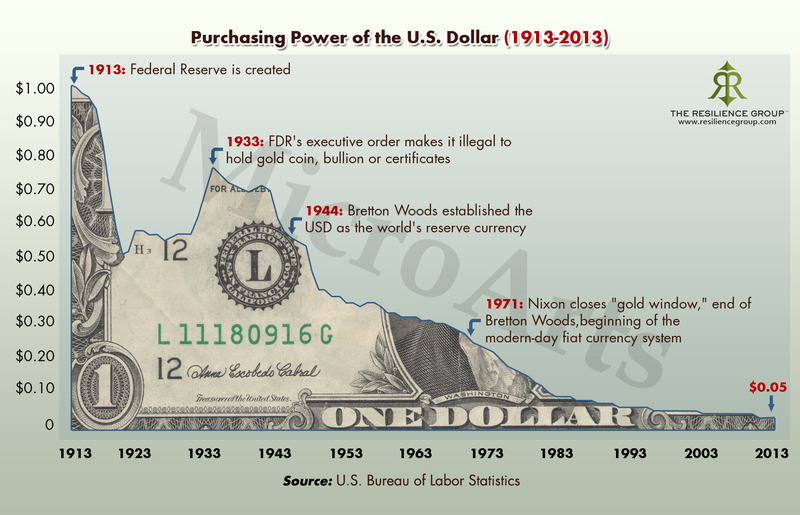 The dollar has lost essentially all of its purchasing power since 1913. And again, remember that it is an open secret that money is given value only by the belief of the people that the money has value, even when, as in our current system, the money admittedly has no intrinsic value at all. This entry was posted in class war, Debt, Debt Slavery, fiat currency, Financial Terrorism, self-issued currency and tagged A Bug's Life, Chris Hedges, class war, control, fascism, Federal Reserve, fiat currency, intrinsic value, oligarchy, purchasing power, self-issued currency, The Air Standard, Truthdig. Bookmark the permalink.